Glass could have worked and almost does. This oddball, and on this evidence, fast-tracked sequel to Unbreakable and Split (it had to be shot while James McAvoy was beefy and Samuel L Jackson available, which given his sparing presence here, doesn’t appear to have been long) attempts to marry the gloomy, realist take on the superhero mythos from the first film with the schlock horror sensibility of the second. This is like putting a cat’s head on a raven’s body. The creature doesn’t live long but while it does it’s fascinating to watch. 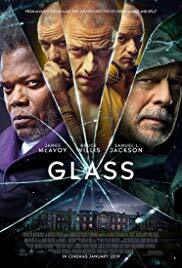 The kernel of the good idea that might have made Glass great, had it been developed instead of being subordinated to M. Night Shyamalan’s rug pulling imperative, is presented in the scene that opens the second act. All three main characters sit in a room in a psychiatric hospital being interviewed by uncanny and curiously time-limited shrink Sarah Paulson, her character having but three days to grill the men and prove her superhero delusion thesis for reasons never explained. She suggests to the brittle bone boy, the schizoid and the strongman that their superhuman credentials can be explained away, and the rest – for example, David Dunn’s apparent ability to read people based on touch, is all in the mind. This, you feel, would be a psychological, rather than plot twist, what might actually carry some weight and retrospectively shake up the first two movies – the evolution of Shyamalan’s technique from formal suspense movie manipulation, in the Hitchcockian tradition, to something more character focused and intriguing. But old habits die hard and, having contrived the hospital therapy setup, though without much tension or anticipation, Shyamalan(autocorrects to Shamen), opts for a grander metanarrative, of the type beloved by comic fans and yes, even those responsible for cinematic universes, and makes a story about interiority, both of environment and mind, a mere backdrop to a grander scheme involving Glass’s ambitions for super-humans and the hitherto unknown organisation trying to keep a lid on an emerging God-caste. Split worked because it gave free expression to its premise in a low budget movie. Glass, by contrast, is hampered in its ambitions by those obvious limitations. Shyamalan can’t afford the grand, clash of the titans climax envisioned by Jackson’s mastermind, so opts for a low tech, web-based alternative. But this social media leak ending undermines the movie’s internal logic because it asks us to accept that in 2019 the world would be floored by clips of apparent inexplicable activity circulating on the internet – this, in the age of photorealistic image manipulation, prosumer visual effects software, and the ubiquity of homemade clips depicting alleged manifestations of the uncanny. Consequently, it feels like an ending written 20 years ago, no longer in synch with the times. Had Shyamalan made Glass then he might have been able to marshal his still vice-like grip of narrative to better sell the movie’s conspicuous contortions. In 2019, however, it all feels forced and unfocused. The lesson of his late-career resurgence, one feels, is that less is more. It’s a lesson that’s been temporarily forgotten here. Certificate: 15 for Bruce Willis comatose, plot twists, and a 20 year-old ending. You know, the logistics of Glass are garbage and it’s barely a good movie, if it’s a good movie whatsoever… buuuut I’ve seen and heard a lot of people take issue with the “leaked video” denouement as being naive, and I don’t think it is, really. Elijah dropped an aggregate of dozens if not hundreds of hours of video, from about forty different angles, not just one Youtube short. It wouldn’t be theoretically impossible to fake, but that much HD CGI (let alone 4K) CGI would be in the tens of millions of dollars range to fabricate, if not more, and not many institutions would be capable of fabricating it. And for what? What’s the product? Add in the fact that there are fully seven eyewitnesses to these “extraordinary beings” (the leads’ sidekicks, plus four uneaten cheerleaders), and the fact that David is a well-known local legend whom many people in Philadelphia already suspect exists, and I personally suppose the leak would be extremely credible. On the other hand, so what? A guy can almost lift a car. My worldview doesn’t change in the face of a guy who can almost lift a car!